Words cannot describe these beautiful little Christmas Trees. 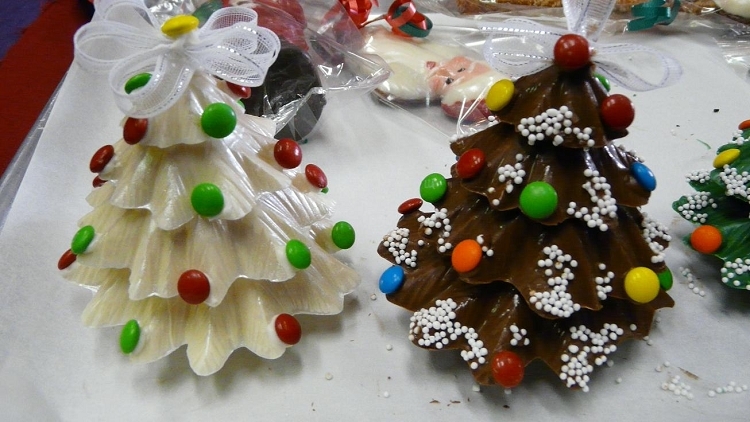 They measure 4 inches tall and 3.5 inches in diameter, they are solid chocolate, each decorated by hand. You can specify the colors/flavors of chocolate. The white chocolate can be colored, any chocolate can be flavored, we can mix in fruit or nuts. We already have added candy canes to a white chocolate one, let your imagination run wild, just contact us with your creation. Get your orders in early, we make'm, pack'm, and ship'm.